The Aquarium of the Pacific, one of the nation’s largest and most-visited aquariums, today unveiled the design of its new Pacific Visions wing, a 29,000-square-foot, two-story sustainable structure designed by the San Francisco-based architecture and design firm EHDD. The first major expansion project ever undertaken by the nonprofit aquarium, Pacific Visions, slated to open in late 2018, will be the new focal point of the institution and will engage the public with epic ocean stories and inspire them to create a better future for our planet. 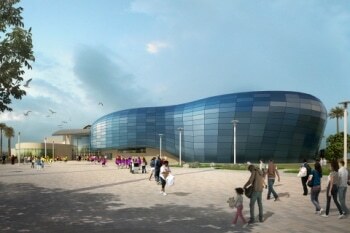 The main Aquarium building will remain operational throughout the construction phase. Pacific Visions is designed as a biomorphic structure that evokes the Pacific Ocean. Complementing the Aquarium’s existing building, Pacific Visions has a façade made up of more than 800 non-reflective glass panels covering an area of 18,000 square feet. The Pacific Visions project includes the Honda Pacific Visions Theater, new Dr. Allen and Charlotte Ginsburg Entrance and front pavilion, changing exhibit gallery, art gallery, and orientation gallery. The two-story, 300-seat Honda Pacific Visions Theater will include a 32-foot-tall, 130-foot long, 180-degree arc digital projection wall and a 30-foot-diameter floor projection disc to immerse visitors in a virtual ocean environment. The theater will bring to life epic ocean stories, allowing audiences to discover new species, witness the processes and phenomena of Earth’s ecosystems, and grapple with the many challenges facing the natural world. Each seat will be wired for interactivity, providing visitors opportunities to explore a range of possible trajectories for our planet and underscoring how human action can lead to a more sustainable future. All stories will be developed by the Aquarium in partnership with leading scientists, filmmakers, and digital artists.